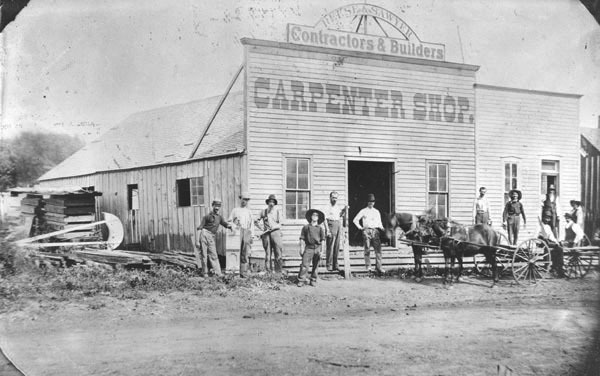 Description: Contractors and builders, W. A. Reese and J. K. Sawyer carpenter shop in the 100 block of North Market. Keywords: Business and industry, commercial building, people, fashion, hats, horse, wagon. Description: This hotel opened in 1877 as the Tremont House. It was formerly the Harris House, then with an addition, became the Empire House. When it was moved to the northeast corner of Emporia and Douglas to be near the Depot it became the Tremont House. Keywords: Business and industry, people, horses, buggy. Description: Looking west at Victorian residence with Gothic Revival styling; located at 209 South Emporia. 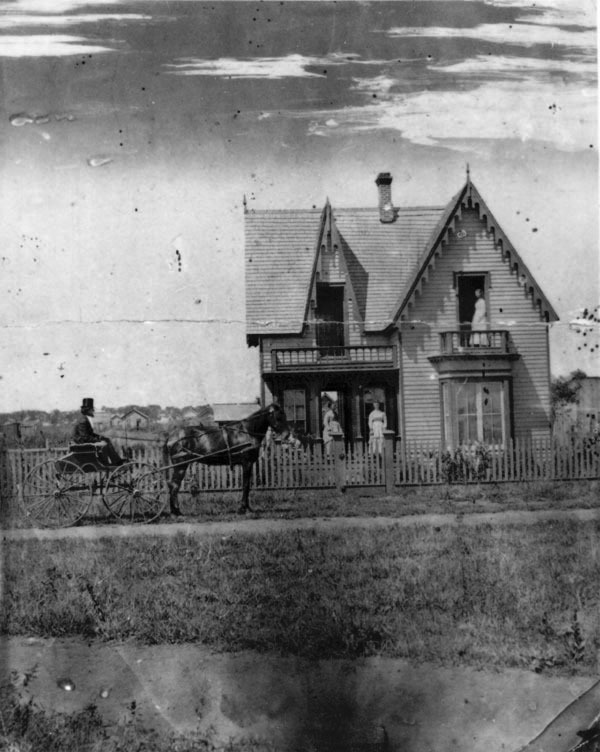 Dr. Henry Owens is seated in the horse-drawn carriage; his family members are posed at the house. Keywords: People, architecture, houses, landscape, Wichita. 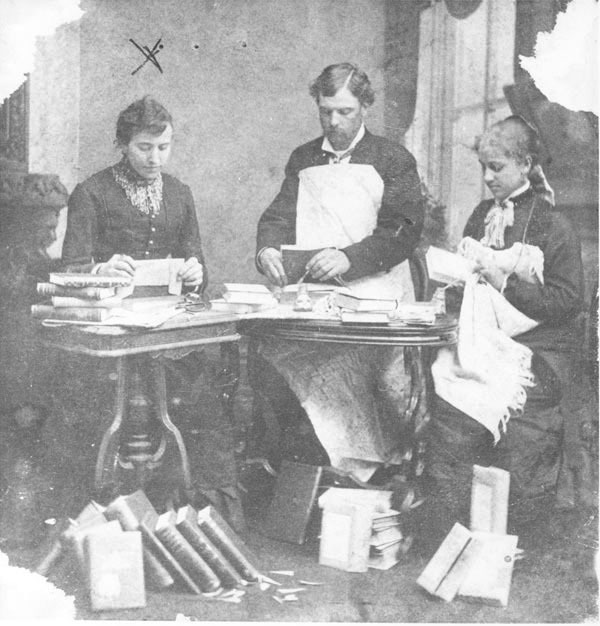 Description: Del Baldwin, Tence Massey and Anna Pope are preparing library books for circulation. The library was housed in Nereus Baldwin's photographic gallery, located in the 100 block East Douglas. 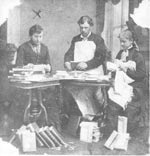 Baldwin was an early Wichita photographer. Keywords: Libraries and museums, people, studio. Description: Portrait of James Richard Mead, one of the early founders of Wichita. 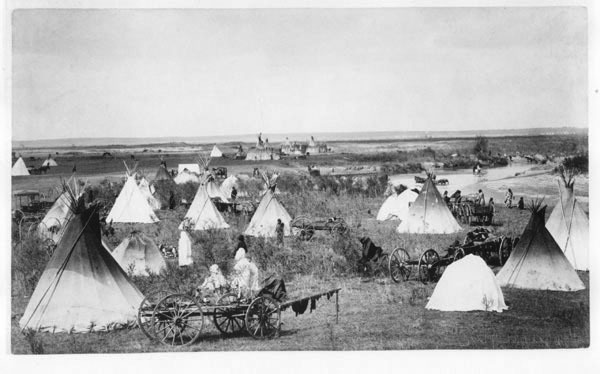 Mead came to Kansas Territory if 1859 and established himself as a buffalo hunter and fur trader. 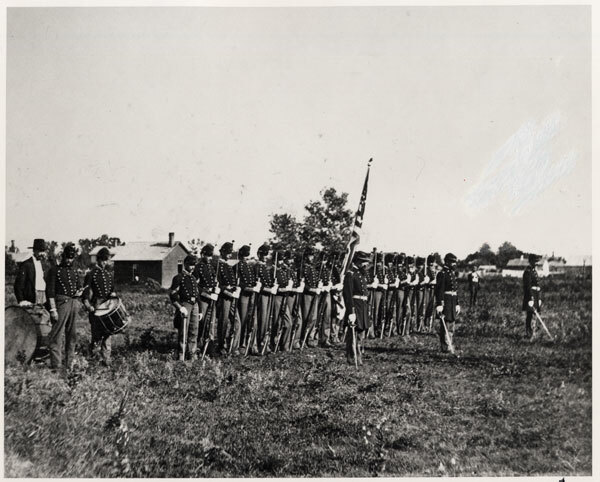 In 1868 he met with a group of men to organize a town company for the site at the junction of the Arkansas River and the Little Arkansas River. 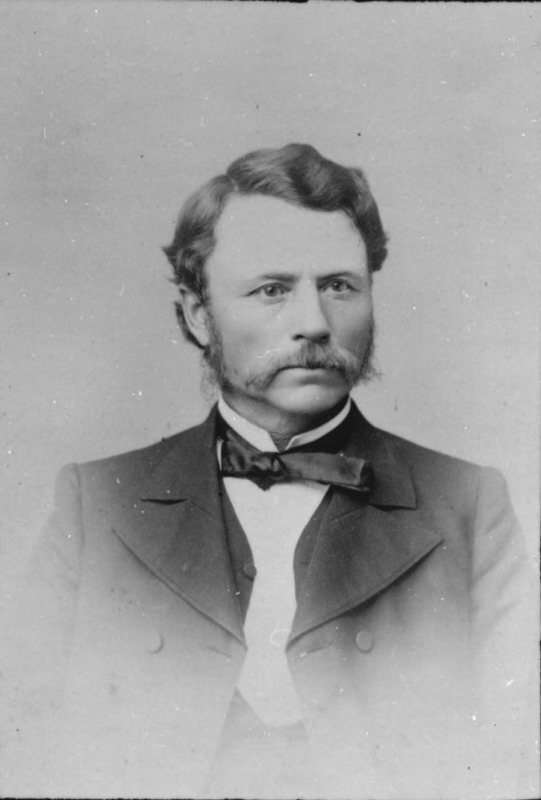 He was instrumental in bringing the Atchison, Topeka and Santa Fe Railroad through Wichita, which secured the position of the city as a trade center. Keywords: People, settlers, pioneers, transportation, business and industry. 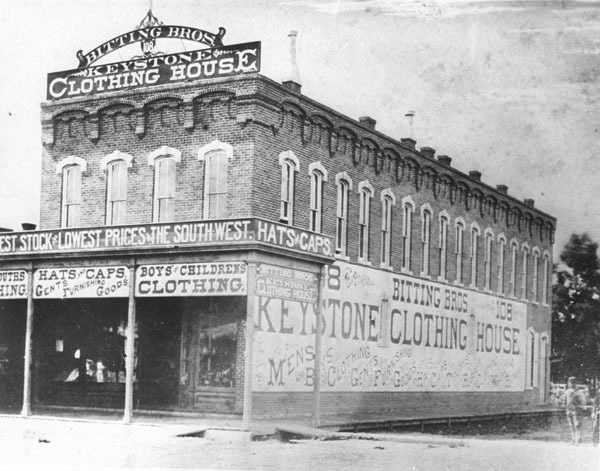 Description: Bitting Brothers Keystone Clothing House, northwest corner of Douglas and Market. 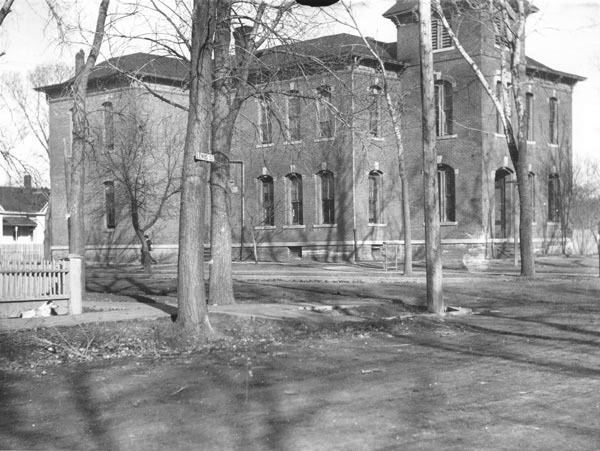 Description: The First Ward School at the corner of Lewis and Lawrence (Broadway). It was constructed in 1879. In 1885 the name was changed to Carleton School in honor of the poet Will Carleton.